I’m always amazed how good of memory our kids have. L has been able to identify logos she sees everyday for quite some time and now, even B is starting to recognize logs…you know, the obvious ones…McDonalds, Starbucks, etc. Near J’s parents house in Oak Lawn is a popcorn place that we pass on our way back to the Tri-State. We always seem to pass it when it’s closed but B always recognizes it and asks if we can stop. We have to tell him no because it’s just not open. After eating lunch with my parents, we headed over to Lighthouse Place to do a little shopping. The first spot we hit was the Gap and as soon as we pulled in to the parking lot, B found a familiar sign. Popcorn World is in the Lighthouse Place in the row of stores furthest to the south. It’s the building that is separated from the main area by a parking lot. It must be a pretty new store as it doesn’t show up on the map between Gap and Casual Male XL yet on Lighthouse Place’s website. The store is pretty bare. 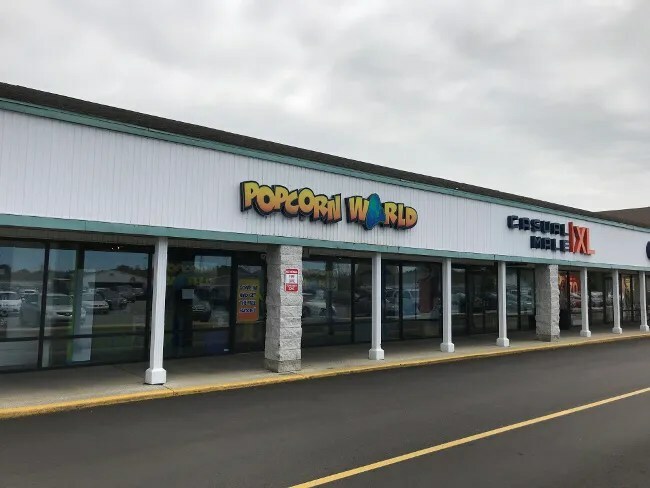 I don’t remember what used to be in this space, but Popcorn World doesn’t require nearly as much space as a clothing store. The store is set up with a large lobby area and an L-shaped counter with rows of popcorn tubs on shelves behind it. 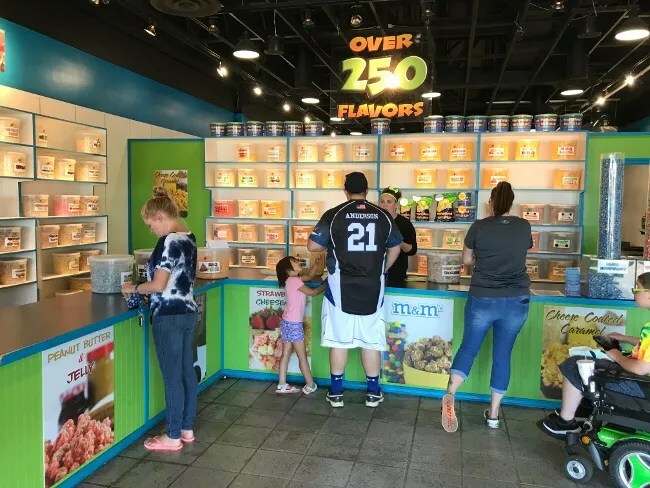 There are over 250 flavors to choose from and if you’re having a hard time deciding, they will let you taste flavors to find the perfect one. There are five categories of flavors. Caramel, Kettle Corn/Butter, Cheese, Gourmet, and Candied. All of the “fun” flavors J tried were all flavored with a caramel type exterior. We were thinking that would be more powder based, but that wasn’t the case. The flavors we tried were good but none of us are huge fans of slick, candy like exterior that these flavors had. We all ended up getting small bags for ourselves. Both of the kids got cheese. There’s really no surprise with this one. 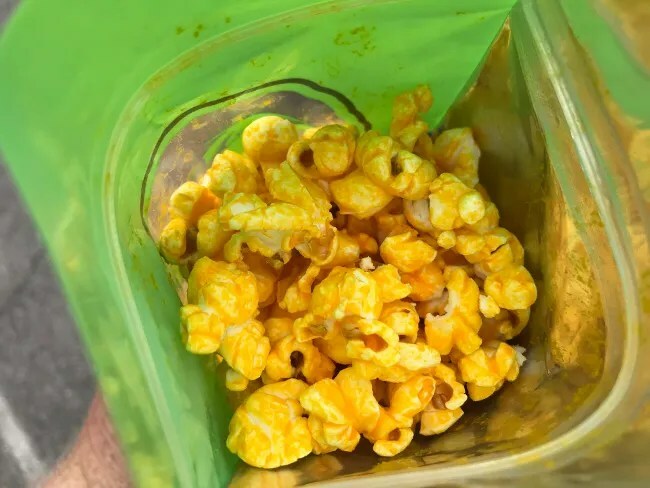 The bag is full of popcorn covered in a powdered cheese that sticks to your fingers. I also went with a powdered flavoring and got the Parmesan and Garlic popcorn. There was more of a cheesy flavor than a garlic flavor which I liked. The garlic was subtle. It’s a combination that could be overpoweringly garlic but there was a good mix and salty cheese to mellow out the garlicky taste. After trying a few flavors, J just went to her old standby of a cheese and caramel mix. Expectations are always high because of how much she loves Garrett Popcorn Shops’ Garrett Mix. She said nothing about the flavor but thought the popcorn tasted stale. I didn’t get that as much with mine but it’s kind of obvious. 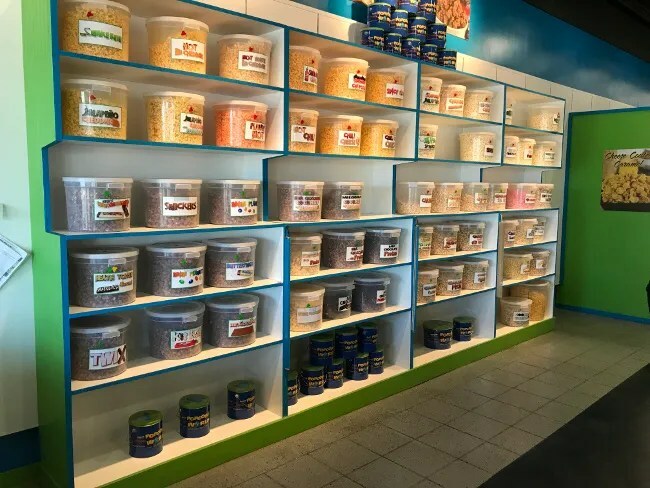 They have 250 buckets of popcorn flavors…they’re not making new stuff every day. If you pick an unpopular flavor, who knows how long that giant bucket. Our total for the four small bags of popcorn and a bottle of water came out to just under $19. 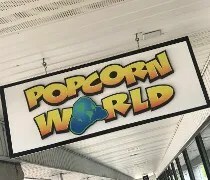 Popcorn World is a good snack while you’re walking around the mall. 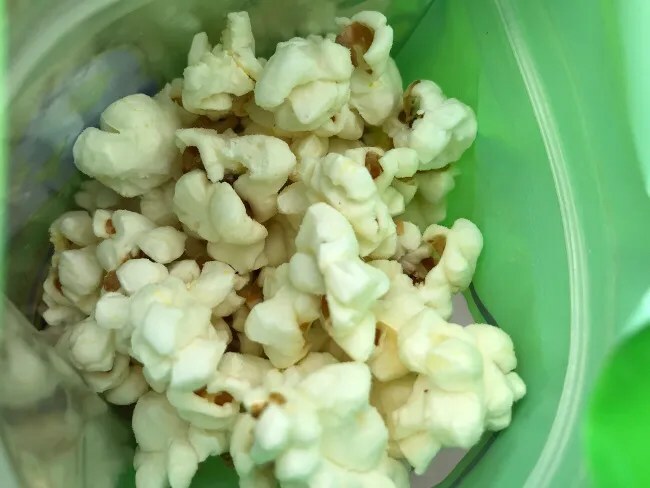 The number of flavors may work against them as it seems like you never know how fresh the popcorn is going to be. The kids had no complaints and mine was tasty. J wasn’t a huge fan, so B may never get to stop and get his popcorn as we sit at the stop light on Cicero Avenue after we leave Nana and Grampa’s house.